This is the fifth post in a series that traces the history of the popular neighborhoods of casas baratas (cheap houses) in Barcelona, a reservoir of immigrant factory workers in the middle of nowhere, historically anarchists and strongly involved in the Civil War against Francisco Franco. We asked scholars, students, amateurs and activists from all over the world to study the case of Bon Pastor, providing them with information through a wiki page. The competitors had to submit a proposal for the neighborhood that (1) respected the historical heritage of the casas baratas, (2) didn’t require the eviction of any resident, and (3) could be organized in a participatory form: not a project, not a plan, but an idea to help Bon Pastor’s neighbors to come out of death row. We didn’t want an idealistic project that bypassed the important need for proper housing for a large sector of population, and we also didn’t accept the dismissal of the elder residents of Bon Pastor as “nostalgic” just because they didn’t accept the Barcelona City Council’s plan for urban renewal in their neighborhood. It was amazing to see that 154 groups from all over the world applied for the competition – many more than the 45 proposals we could accept! The competitors came from countries so far away as Thailand and Turkey, and also from close by in Italy, Germany, Portugal and France. Other people sent proposals from other parts of Spain or Catalunya, and many from Barcelona itself. This was a great result for a competition that offered no prize, except for publication, and that was organized completely through voluntary work with no funds at all. Every proposal came in DIN-A1 format, typical architectural size, from a minimum of 1 to a maximum of 3 sheets. The jury met in the beginning of march 2010 to study the project. Deciding was not easy, since we didn’t expect so many proposals. We had to ask the members of the jury to make a grand effort, and also to deal with the difficulties that the Avis del Barri (Grandparents of the Neighborhood, an influential neighborhood association) and the other neighbors of Bon Pastor interested with the activity, in coping with all the intellectuals coming from outside (no matter if from Barcelona’s or Harvard’s University, the academy is outside the neighborhood anyway!). Among the organizers, many were surprised to see that neither the Asociación de Vecinos, nor any other organization in the neighborhood (school, medical center, gypsy association, et cetera) dared to give us support, except for Avis del Barri. For me, after years of studying it, and some months living in Bon Pastor, this was almost obvious: fear and impotence spread through the neighborhood as a consequence of Barcelona’s Urban Renewal Plan. Nothing that isn’t organized or supported by the Barcelona City Council can take place in Bon Pastor. They see every autonomous initiative as a potential threat to the stability of the forced consensus achieved for the city’s Urban Renewal Plan. Rumours began to spread against Repensar Bonpastor (the official name for our competition) many months before the jury arrived to visit the neighborhood. But for us, this was a confirmation that we were moving in the right direction. The jury selected 20 out of the 45 proposals. Of those, 4 actually won the competition. We showcased these proposals in public a few weeks after the jury decided, and began exploring how they could be applied to the reality of Bon Pastor, discussing them with the people of Bon Pastor already interested in finding alternative ideas. But things began to get harder just after the end of the competition. 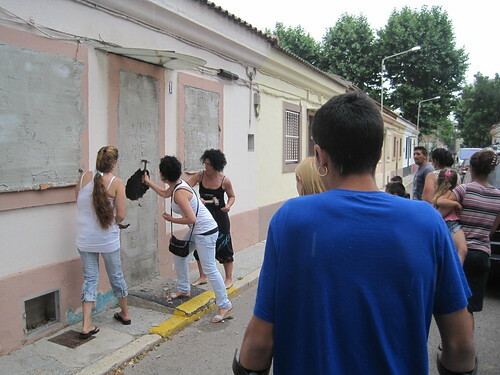 At the beginning of June, 2010, 26 families of Bon Pastor marched through the neighborhood’s streets with the intention to squat in some houses that the City Council wouldn’t open for the neighbors who asked for them, using the Urban Renewal Plan. 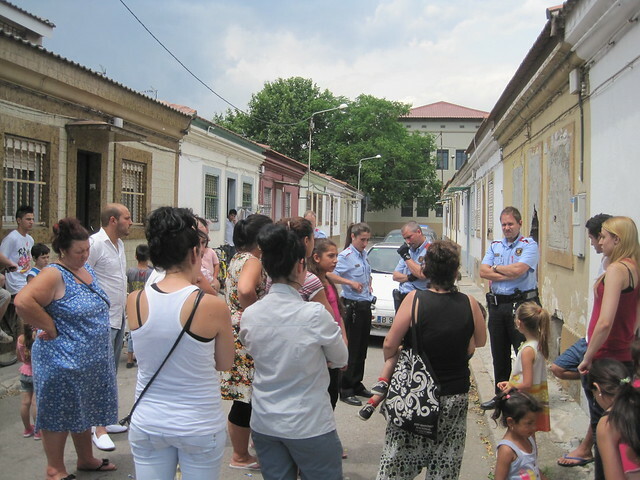 The City Council’s response was to evict all of the families and demolish the roofs of the houses where squatters lived, even if some of them should remain closed for many years. Tension increased after this action: every alternative idea became even more dangerous and treacherous, so the members of Repensar Bonpastor began to work much more outside of the neighborhood than inside, trying to publish the results of the competition and “spread the word” of the difficult situation of the casas baratas. Neighbors of the Casas Baratas squatting the houses, June 19th, 2010. Many months after the end of the Competition, while we write down and organize the results, we are still trying to understand how much all of this was really worth. The City Council didn’t consider any alternative proposal (except declaring they would spare 12 houses for “historical memory”). While we are being invited all over Europe to explain this “experimental project”, and the Alliance of Inhabitants is promoting a collection of signatures, the residents of the next 192 casas baratas are being forced to abandon their houses. Some of them are relocated to the new flats, some are not. Avis del Barri doesn’t give up its struggle, but it’s too hard, and it’s difficult to help them. Something different should happen (besides the economic crisis, or political changes), otherwise Bon Pastor’s casas baratas will disappear forever; and with them, the dream of a different neighborhood, an alternative to the big homogeneous blocks, standard flats, closed up families, and a public space that is nothing more than a no-place to cross over. We imagine a different city, starting from the 500 houses that will remain after the new wave of demolitions, which began just this month in 2011. Maybe we still have time to rethink – repensar – on it. Read this full series by starting with the first post.